October is National Cookie Month and TODAY is National Homemade Cookie Day. The following companies generously sponsored various cookie month projects. I may not have used all of them in my recipes, but this project is in no small part thanks to them and their incredible contributions: Bob's Red Mill, The Daily Meal, India Tree, KerryGold, King Arthur Flour, Product of GIR, KaTom, SunButter & Wilton. To kick off the month, I want to share my best cookie recipe. I made these cookies for the first time last October while preparing to enter the World Food Championships in Las Vegas. These cookies are the best cookies I've ever created and I'm superbly proud of them. 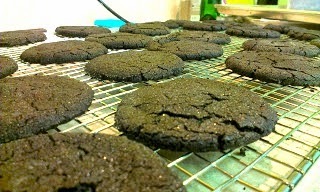 Originally, I made them as sandwich cookies with an Earl Gray tea whipped ganache. While incredibly vibrant and floral, they are too rich and decadent to be sandwiched like an Oreo (because these little beauties are in fact grown-up Oreo cookies, although not vegan [sorry, not sorry]) In short, they whip up quick, bake very quickly and are intensely flavorful and fun to make. Who doesn't like a little sugar-crusted cookie? Preheat oven to 375 degrees F. Into a medium-size bowl, sift together flour, cocoa powders, baking soda; set aside. In the bowl of an electric mixer fitted with the paddle attachment, cream sugar and butter until light and fluffy, about 2 minutes. Add 1 egg, orange zest and cardamom; beat to combine. With mixer on low speed, gradually add the flour mixture; continue beating until dough is well combined. Transfer to oven, and bake until cookies are firm, about 10 to 12 minutes, rotating baking sheets halfway through. Transfer cookies to wire racks to cool completely. oh, gosh, these look amazing! I've never used cardamon, I'll need to remedy that soon. Thanks for sharing! I adore Cardamom and think I would have a hard time sharing these ones. They look delicious. Made these tonight and they are very good. Next time I will add more orange zest and sift the cardamon in with the flour. Some cookies had more cardamon flavor than others, so maybe that would help? I may add a tad more cardamon, since I really like it. Definitely will make these again.